Home» » AP Teacher Eligibility Test AP TET May 2018 Notification Scheduled. 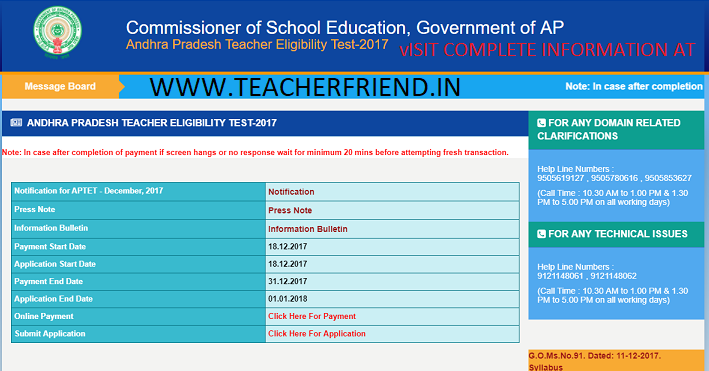 AP Teacher Eligibility Test AP TET May 2018 Notification Scheduled. AP TET May 2018 Notification Important Schedule for TET Paper 1 and Paper 2 Online Application Schedule and how applying in Online Application Syllabus for AP TET May 2018 Paper1 and Paper2 Syllabus and Eligibility Cretariya for pass marks AP Teachers Eligibility Test (AP TET) May 2018 Notification Online Application Eligibility Cretariya AP TET Paper -I & Paper - II Syllabus and pass Eligibility Cretariya download at aptet.cgg.gov.in. Andhra Pradesh School Education Guidelines for conducting Andhra Pradesh State Teacher Eligibility Test(AP-TET)underthe RightofChildren to Free and Compulsory Education Act( RTE), 2009–Order as per G.O.Ms.No.91 Dated:11-12-2017. RTEAct 2009, of Ministry of Lawand Justice,Govt.ofIndia,dt.27.08.2009. NCTE,Guidelines for conduct of TET communicated vide Lr.No.76-4/2010/Acad,dt.11.2.2011. National Council for Teacher Education (NCTE),New Delhi has laid down minimum qualifications for aperson to beeligible for appointment as a Teacher for Classe I to VIII in its Principal Notification dated 23rdAugust,2010 and amendments issued there on. Theminimum qualifications include a Passin Teacher Eligibility Test(TET). Pursuant to the said Guidelines,it has been decided to conduct Teacher Eligibility Test(TET) atleast once every year for all persons,who aspire to become Teachers for Classes ItoVIII inall Schools (Govt./ZP/MP/Municipal/ Recognized Pvt Aided& Pvt.UnAidedetc.,) intheStateofAndhraPradesh. (Paper-I) and VI to VIII classes (Paper-II) as given in Information Bulletin. appear for the APTET May 2018.
in the relevant statutory recruitment rules framed by State Government from time to time as on the date prescribed there in for possession of such qualifications. APTET, and the breakup of the total 150 marks among various parts of the paper are given in the Information Bulletin. Get Download Revised AP TET Scheduled CLICK HERE. Get Applying online Application for AP TET CLICK HERE. Get Download AP TET May 2018 Notification and Information Bulletin CLICK HERE. Get Download AP TET May 2018 Syllabus Click Here.